Our garments can be fully custom tailored using these instructions, measuring yourself is simple with our diagrams and descriptions. Please note that the custom versions of any of our garments will have a place for you to submit each of the measurements that garment requires. If you have any questions regarding sizing, please feel free to contact us. Back to Standard Sizing Information. Use this for the Front Height (torso) of a catsuit. 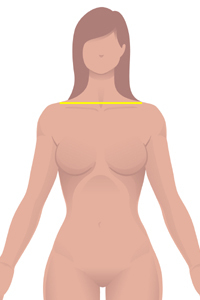 Place the measuring tape in the center of your crotch between the legs, measure up to the center of the neck. Place the end of the measuring tape in the center of the crotch (Between the legs) and measure to desired bottom of a pant leg. 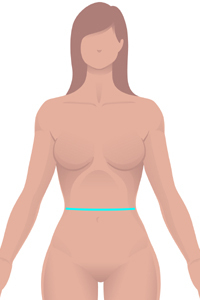 Place the end of the measuring tape in the center of the crotch (Between the legs) and measure upward to the desired front rise for shorts, leggings, pants and swimwear. Place the end of the measuring tape in the center of the crotch (Between the legs) and measure upward to the desired rear rise for shorts, leggings, pants and swimwear. Measure around the widest part of the thigh. Measure around the widest part of the knee. Measure all the way around the calf of the leg. Measure all the way around the ankle at the ankle bone. Measure all the way around the neck. Measure across the back from the shoulder socket across to the other socket. Measure from the shoulder socket to the precise point where you prefer your sleeves to end.